Thank you for visiting our site and taking the time to learn about some of Mother Earth's precious Angels that we are helping. Angels are Messengers, Teachers, Guardians and Companions, they take on many forms some being animals. 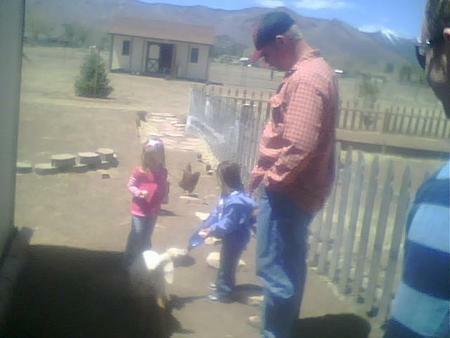 Yes even farm animals.!! Those of you who have experienced love and joy with an animal companion know just how special they are! They cuddle with us, lick our tears away, protect us from dangers and they help us heal in many ways. They are part of our families giving love unconditionally. Our love, and appreciation for animals and knowing, that there are many in need, who have been abandoned or abused is the reason we go beyond the individual work we were doing and expand to helping hundreds of Earths Precious Angels. We've have had a lot of success thanks to donors and volunteers. You can make a difference by becoming a volunteer or by making a donation in any amount you can give. 100% of all donations goes directly for the animals, with administrative expense being all volunteer. The more help we receive the more we can help other precious animals needing our help. 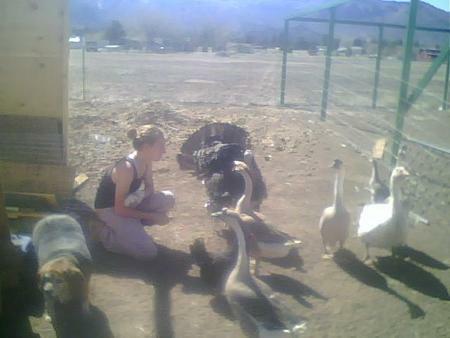 We can provide permanent homes on our Sanctuary or find other loving homes. 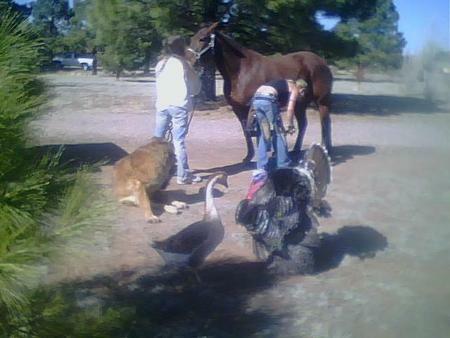 At our former Flagstaff location some of the animals were able to help heal volunteers who have visited the sanctuary. Many of the animals at the rescue have special abilities to share that will help improve the health of us and our angel friends. Earth Angels Animal Sanctuary urges you to give your support to any of the rescue or humane pet rescue organizations near you in whatever way you can... whether it's through Adopting, Sponsoring, Charitable Donations, Volunteering, or Gifting of Recycled Materials such as Building Materials, Fencing, or Feed Containers. Earth Angels Animal Sanctuary Our Facility isEco Friendly using a variety of recycled materials such as straw bale insulation, solar lighting, passive solar using landscaped trees for heating and cooling and Grey water for ornamental trees. 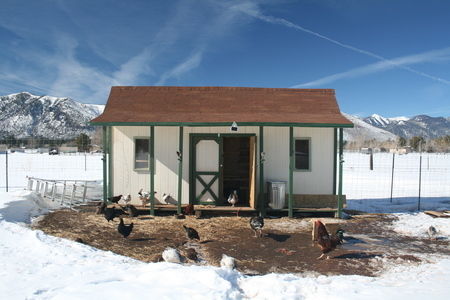 Earth Angels Animal Sanctuary is a strong supporter of Sustainable Permaculture Technologies. 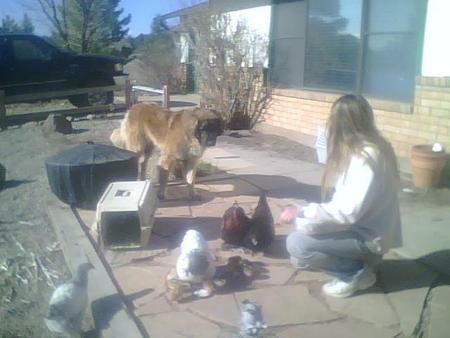 Earth Angels Animal Sanctuary that rescues and rehabilitates abandoned and neglected domestic animals. We provide medical care, proper nutrition, clean and safe housing, and lots of love. 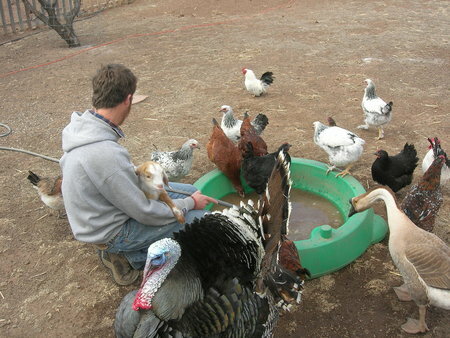 We are pleased to announce that our animal rescue program has extended beyond Cats and Dogs and we are now working with farm animals such as Mustang and Domestic Horses, Chickens, Turkeys, Geese, Guinea Hens, Pea Fowl, Goats and American Bison. Earth Angels Animal Sanctuary IS A NO KILL FACILITY. We work to rescue, rehabilitate, adopt, or foster animals and do our best to provide loving humane treatment for all the animals in our care. 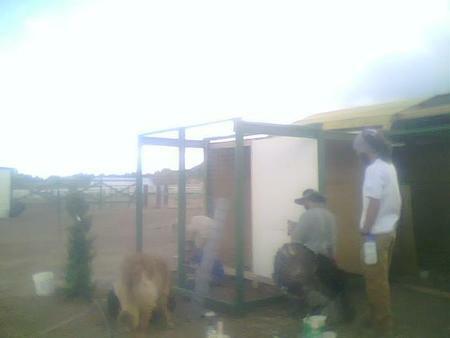 Americore Volunteers helping build a much needed combination Tack Room and Fly Pen. 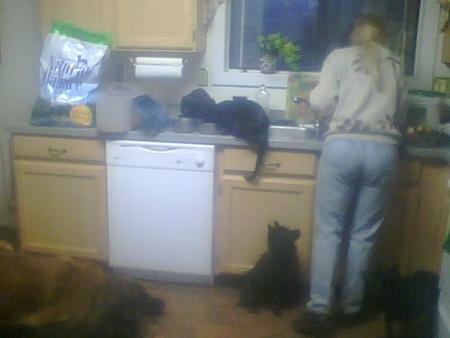 Susinn is preparing a special meal for the animals while they eagerly wait for their dinner. Torrey & Audrey who are with the WWOOFERS Organization. 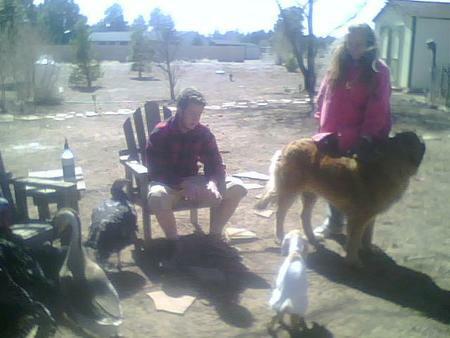 They are having a moment with some of the friends at the Flagstaff Sanctuary. Virginia who is a natural hoof specialist is trimming Roxy's hooves while some of her buddies linger around. Most the animals at the Rescue are very good friends with each other and always show a bit of curiosity when someone new visits. 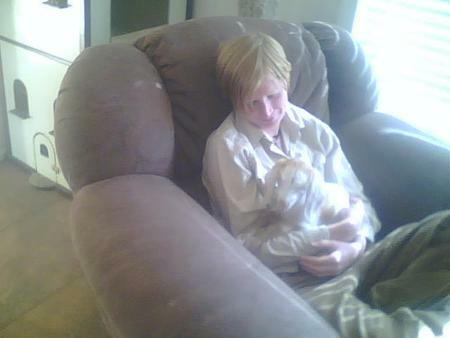 Kelly is bottle feeding Amber who was one week old and on her way to someones dinner table if AFR had not come to her rescue. Some cultures eat baby goats called birria, as do others eat veal. 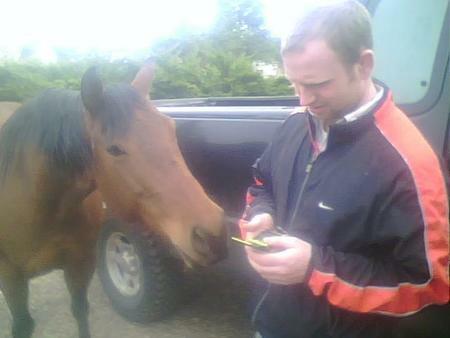 Roxy with a natural curiosity, especially when Bill is text messaging something new to the horse world since the discovery of cell phones. This is a view from the green house. This fall we have been in a drought. 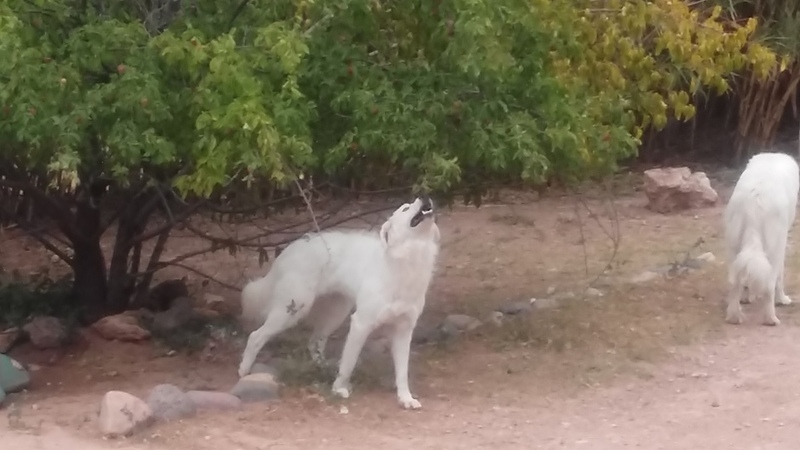 Bella and Angie at the Rimrock Sanctuary picking and eating fresh plums.